You might be wondering how it is that I’ve been listening to so many audio books lately? It’s because I’m busy with the stocktake at the library, and listening to an audio book on my laptop helps to while away the tedious hours spent scanning the school’s collection. This narration in this edition of The Invisible Man works really well, because it’s a plot-driven story that lends itself to listening, even though I already knew the story well. My father gave me a copy of it when I was about 12, and I was immediately bewitched by it. 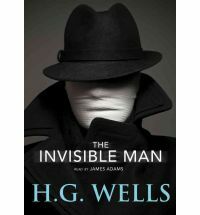 At that age, I was like the Invisible Man himself, initially entranced by the idea of being able to do forbidden things undetected, and I found it very sobering to see how Griffin’s life unravels along with his sense of right and wrong. The tension in the story derives from the fact that the initial impulse can’t be reversed. Griffin is a young man who left medical school to experiment with optics, and one day when he’s had a squabble with his landlady he decides to try the procedure that’s succeeded on a cat, on himself. He gets away from his hassles, but soon discovers the disadvantages. People walk into him. He’s cold. He can’t work or earn money. When he dons a disguise of bandages and a false nose, he can’t eat in public without people ‘seeing’ his invisibility. Smothered in clothing to conceal his invisibility, he decamps to a small village called Iping, West Sussex, in a snowstorm. There he experiments further to try to reverse the process, but he manages to draw unwanted attention because of his bad manners and filthy temper. The villagers – a most endearing bunch of people, slow to react but definitely not stupid – eventually suspect him of a robbery, which he’s carried out because he’s running out of money to pay for his board. Soon he’s on the run and things go from bad to worse with a truly tragic ending. As a child, I thought that Griffin got his just desserts, but now I see that the social consequences of his impulse meant an intolerable life, and his futile attempts to restore his body to normality unhinged his mind. Despite the terror he inflicted throughout the countryside, at the end, when his naked, battered body becomes visible at last, even his intended victims can’t help but feel compassion for him. The narration by James Adams is excellent. I wonder if 12 year-olds today would enjoy this story … it’s probably a bit tame compared to all those R-rated films that they watch! Out of print, try your library. Thanks for your blog about the Invisible Man. I abandoned the book a while ago after I realized the main character wasn’t likeable. That said, I was left with a curious wondering what the story was about, your blog post enlightened me, thank you. Oops, you’ve reminded me that I forgot to add a Spoiler warning! I read this when I was about 14 I think, and recently started it again on the Kindle but didn’t get very far. I’m pleased to read your views on it – a useful resource for people who google the title too. I hope you and yours have a wonderful Christmas – and I wish you much successful book-blogging next year. Funny, I read two reviews of this book within a week of each other. I’ve just picked up a copy from my library. That’s what I love about the web: someone, somewhere is always reading the same book!